Security personnel have been deployed in Lahore and Okara to provide security at sensitive polling stations. ─ DawnNews screengrab. Contingents of Army and Rangers personnel have been deployed at Lahore and Okara polling stations. ─ DawnNews screengrab. 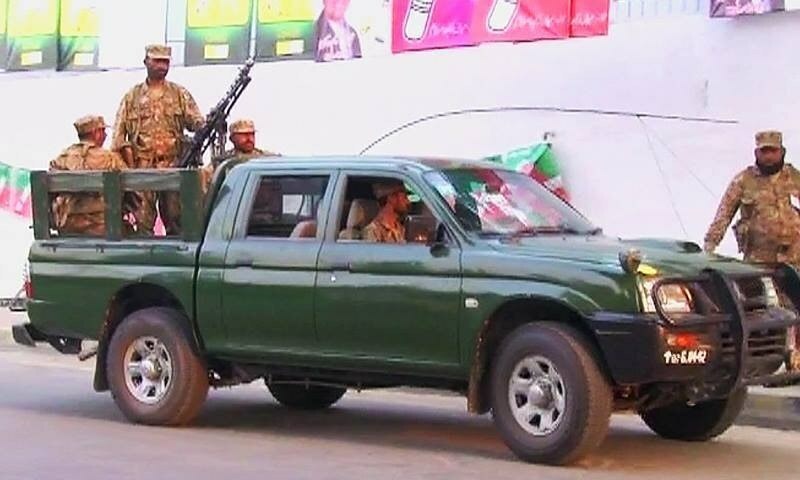 Security has been deployed at Okara's NA-144 constituency. ─ DawnNews screengrab. Voting under way in Okara's NA-144 constituency. ─ DawnNews screengrab. 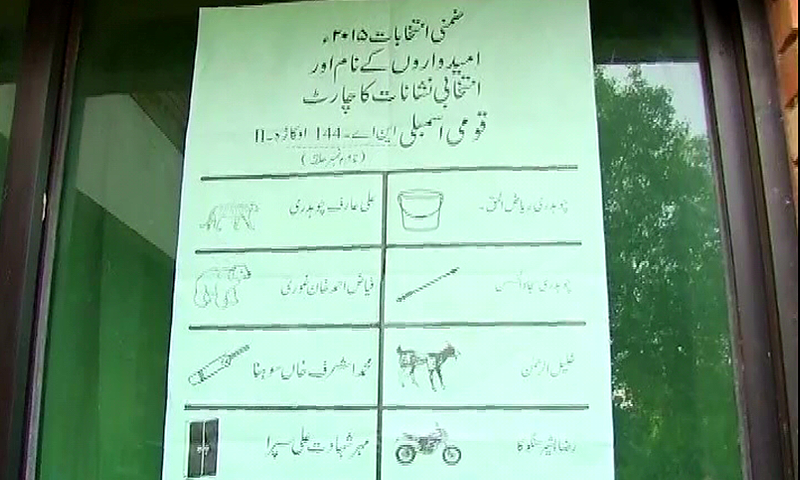 Election posters and flyers on display in Lahore. ─ DawnNews screengrab. 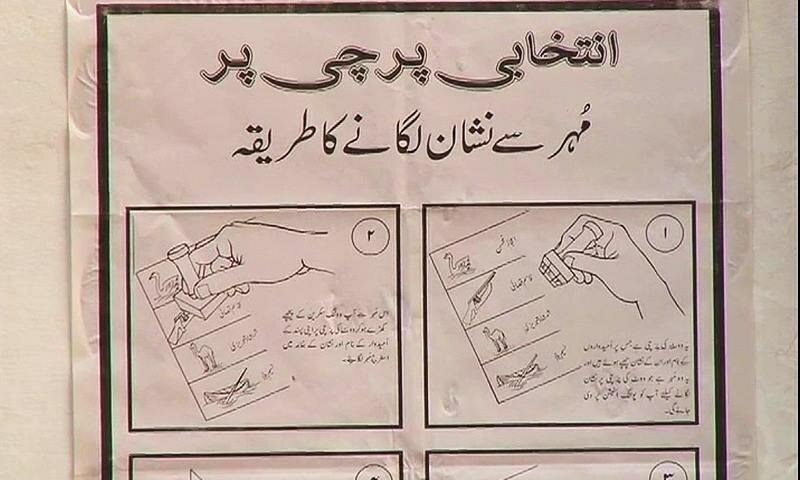 Polling instructions for by-polls. ─ DawnNews screengrab. Voting at Okara's NA-144 is under way. ─ DawnNews screengrab. LAHORE: Pakistan Muslim League – N leader and former National Assembly speaker, Sardar Ayaz Sadiq, reclaimed his NA membership after winning re-election in the same constituency he was deseated from in August, defeating Pakistan Tehreek-i-Insaf's Aleem Khan after a tight contest, reported DawnNews. Unofficial results from all 284 polling stations in NA-122 put PML-N's Ayaz Sadiq as victorious, bagging around 75,000 votes, while PTI's Aleem Khan came in second with around 71,000 votes. In Lahore's provincial assembly constituency, PP-147, PTI's Shoaib Siddiqui won the by-poll, defeating Mohsin Latif of the PML-N, DawnNews reported. In Okara's NA-144, independent candidate Riazul Haq Juj came out victorious with around 63,000 votes per unofficial results, with PML-N's Ali Arif Chaudhry coming in second, bagging around 36,000 votes, DawnNews reported. PTI's Ashraf Sohna came out fourth in the constituency. PML-N leaders were joyous on the occasion, with Maryam Nawaz, Abid Sher Ali, Khawaja Asif and Khawaja Saad Rafique taking to social media website, Twitter, to express their reactions. 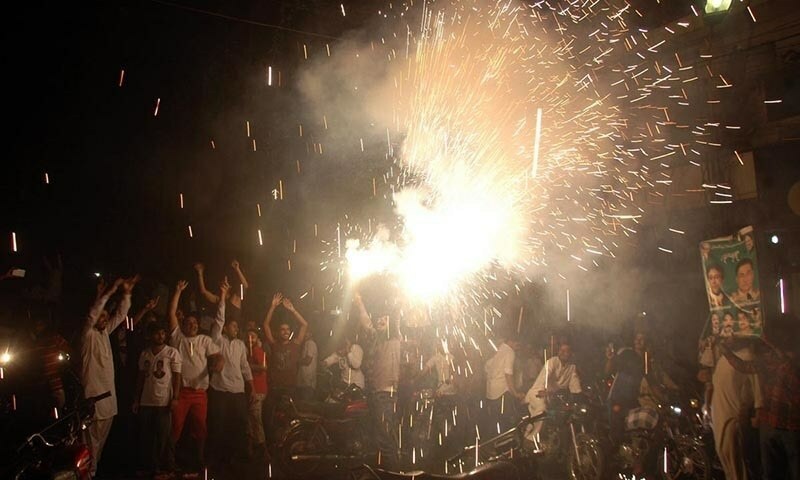 PML-N supporters were also seen celebrating the victory in various parts of the city, distributing sweets and setting off fireworks. 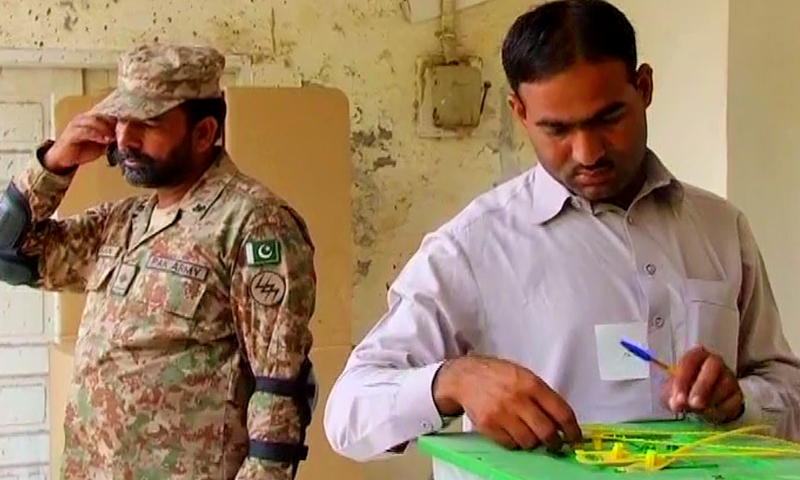 Army and Rangers personnel were deployed at both Lahore and Okara polling stations. 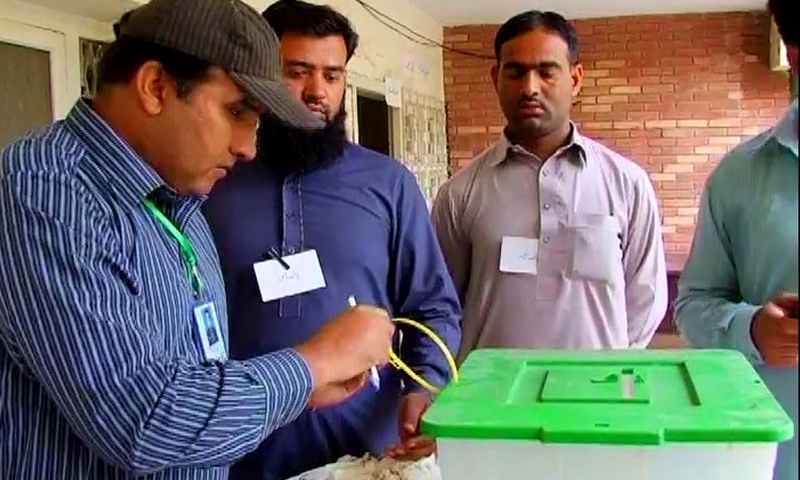 A bridegroom in Okara cast their votes during the NA-144 by-poll. ─ DawnNews screengrab. There are nearly 350,000 registered voters in Lahore and 316,000 in Okara. Of the 284 polling stations in Lahore, there are 134 each for men and women, while 16 polling stations are for both genders. 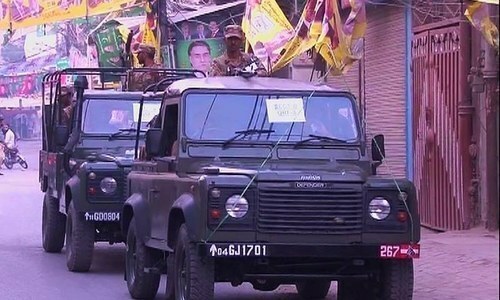 The entire constituency has been declared 'sensitive', but 12 polling stations have been labelled 'highly sensitive' and more security personnel have been deployed here. In Okara, there are 210 polling stations, 25 of which have been declared 'sensitive'. PML-N MPA Uzma Bukhari, nominated to the women's quota seat W-318 in 2013, said she had been receiving threatening messages allegedly from PTI supporters since Friday. She said Punjab Chief Minister Shahbaz Sharif, Interior Ministry Chaudhry Nisar, Deputy Inspector General (Operations) Dr Haider Ashraf, and the Cyber Crime Cell had been in contact with her. CM Shahbaz has also directed Inspector General Police (IGP) Punjab Mushtaq Sukhera to conduct an inquiry into the incident and sought a report in this regard, the IGP's office confirmed. Shahbaz ordered the immediate arrest of those involved in the act. PTI candidate for NA-122 Aleem Khan while speaking to reporters asked voters to "vote their conscience". He said the party was satisfied with security arrangements for the elections, adding, "If the election is transparent and continues this way till 5:00pm, then we have no complaints." Aleem Khan said party chairman Imran Khan was due in Lahore shortly. PTI NA-122 candidate Aleem Khan speaking to reporters. ─ DawnNews screengrab. Voting at polling stations 96 and 98 was temporarily suspended, amidst fears of rigging by a PTI polling agent. While speaking to DawnNews, the agent said "The ballot boxes were not sealed in front of us, the ballot papers were not checked in front of us, and when Ayaz Sadiq came, they quickly started the balloting while only one polling agent of ours was inside." "As per election commission rules, all boxes have to be attested and sealed in front of a polling agent. They did everything themselves. When Ayaz Sadiq came, they immediately started polling," he claimed. "We think polling should be suspended until the matter is resolved, otherwise there might be rigging," he said. An application was submitted to the presiding officer detailing the matter and polling resumed shortly after. Meanwhile, there were 30 complaints filed with the ECP relating to by-elections in NA-122 Lahore, most of which were regarding the non-registration and absence of names from the voter's list. Several polling agents belonging to PTI had also submitted complaints with their respective Returning Officers regarding non-functioning CCTV cameras installed at the polling stations. Additional Secretary Election Commission of Pakistan (ECP) Fida Muhammad Khan said that no rigging complaints or complaints against polling staff and security personnel had been filed so far. They added that no request had been received for extension of polling time and only those voters will be allowed to cast their votes who are inside the polling stations by 5pm. While speaking to the press, PTI's Chaudhry Sarwar took notice of suspension of voting at the Garhi Shahu polling stations and said he was hopeful the presence of Army and Rangers would help prevent rigging. The PTI said it had registered its complaints with the Election Commission of Pakistan (ECP). PML-N candidate Ayaz Sadiq speaking to the media Sunday morning said his party would "accept the result, whatever it is". "Hopefully it will be in our favour," he added. Sardar Ayaz Sadiq speaking to the media on election day. ─ DawnNews screengrab. The former National Assembly speaker said his morale was high. "I am very jubilant, very happy, very focused, and very confident," he told reporters. "Look at my camp and look at other party's camps ─ you will see the difference," he said. "Our polling agents reached our camps at 7:00am, despite polling beginning at 8:00am." The PML-N has also asked activists not to engage in fights and arguments, Ayaz said. "Calmly cast your votes. If people are fighting, instead of taking the law into your hands, inform the police," he said. DawnNews footage showed Ayaz Sadiq casting his vote at the Garhi Shahu polling station. Ayaz Sadiq exercising his right to vote at the Garhi Shahu polling station. ─ DawnNews screengrab. The much-awaited by-election in Lahore’s NA-122 constituency ─ the ‘Takht-i-Lahore’ ─ is where former National Assembly speaker, Sardar Ayaz Sadiq of the PML-N, faces off against Aleem Khan of the Pakistan Tehreek-e-Insaf (PTI). Both NA-122 and NA-144 fell vacant when an election tribunal de-seated Ayaz Sadiq and Arif Chaudhry. The contest for the provincial assembly seat, PP-147, is mainly between PML-N’s Mian Mohsin Latif and PTI’s Shoaib Siddiqui. Take a look: NA-122 election tribunal deseats Ayaz Sadiq, orders re-polling. Ayaz Sadiq had been elected to the NA from the same constituency in the 2013 general election, having defeated PTI Chairman Imran Khan. But on Aug 22 this year, an election tribunal deseated Ayaz Sadiq, declaring the 2013 election in the constituency null and void, and ordered a re-election. The decision had come following a petition by runner-up candidate Imran Khan, who had challenged the 2013 election result on grounds of rigging. While the PML-N leader has challenged the tribunal’s decision in the Supreme Court on grounds that the “election tribunal’s impugned order was against facts and relevant laws,” his party had decided to contest the by-poll in light of the election tribunal’s order. The by-poll has gathered a lot of hype not just because of the high-profile personalities involved but also because NA-122 was among the four controversial constituencies — the other three being NA-110 (Sialkot), NA-125 (Lahore) and NA-154 (Lodhran) — where PTI had demanded for voters’ thumbprint verification in the hopes of determining the legitimacy of the 2013 general election. It is pertinent to mention here that other than NA-110, election tribunals in the remaining three constituencies (NA-125, NA-122, NA-154) had also declared the respective elections as null and void, ordering re-polls. Ayaz Sadiq has been able to gather support of a group of the Pakistan People’s Party (PPP) led by Dr Safdar Abbasi, Jamiat-e-Ulema Pakistan Noorani (JUP), Jamiat Ulema-i-Islam – Fazl and other clerics in the constituency. If PMLN loses this seat, it would be better for Pakistan. It would put PMLN governments (Federal & provincial) under pressure to deliver better service to the nation and make PTI more vibrant opposition which is badly needed in Pakistan. Planned Rigging has been exposed and acknowledged by courts, PTI claims has been proved & again Mr.Ayaz Sadiq contesting, really difficult to be politician and have self conscience. Let's hope People of Lahore give a true, honest and unbiased vote. Good luck to PTI. Vote IM. get rid of these looters. PTI would win the election of NA 122. Support for Ayaz Sadiq, a democrate and gentleman. PTI will be rejected from NA-122. True leadership resides with PML (N). Hope everything goes well in safe & peaceful atmosphere & whoever win should respect the mandate of people & work for them, but one thing for all Punjab, if PMN-L wins again at least then never ever pass any negative comments against MQM, since the way you support & have affiliated with PML-N Karachiites have same with MQM - Right or Wrong it should be our decision.. I dare a win by PML N .
Hoping both parties will accept the result after final verdict of respective constituencies. let's hope for better!! Both parties try their best to convince people for their agenda, let's people decide which party is better in their eyes this is real democracy. It will be very tough for PTI and PML. The dynamics of politics in Pakistan is changing and it is becoming extremely difficult for the traditional parties to maintain the old style of political campaigning, and contacts with the local voters. I will give PML advantage as they have done extensive work and have a strong base on the ground level. PTI makes a lot of noise but don't think they have enough to prove that they will bring the much needed change. I like that PML is kept under pressure from PTI, so that they continuously show their efficiency. This has become a battle between Ayaz Sadiq and all of PTI. It shows how badly PTI needs to win this election. Now if Ayaz Sadiq defeats PTI for the third time (which I expect) then Imran Khan should accept that he simply doesn't have the people's support and he should stop being a nuisance. Well a single constituency cannot be regarded as Takht-e-Lahore. Imran Khan is known for taking extreme positions and today he has turned a routine by-election into sort of a decisive political war even after knowing that he can lose here. Hope everything goes well in peaceful/safe conditions & the winner will respect the mandate of people & work for them, For whole Punjab in case you select PML-N again then never ever comments against MQM, since the reason you support & affiliated with PML-N Karachiites have same with MQM & the way you feel hurt if some one give negative/harsh comments for PML-N/Nawaz Karachiites feel same for MQM/Altaf, we all should respect each other's choice..
Ayaz Sadiq would accept the result as he accepted that of Tribunals, but Supreme Court rejected his Stay Order plea due to other charges, thus they politicized to contest although, the had requested Stay Order. I can see to some extent people of Lahore are same like people from NA 250. @Hamood very true. PTI is just pressuring pml and the voters by these slogans. I strongly suggest to PTI to prove their worth in KP where they have got full support of the voters and international organizations to get things back in order. So far in KP it is the same old style of governance, corruption and jobless youth. People want jobs, business, and honorable living conditions. I don't think that PTI has done any serious effort in this regard. I want PTI to win, but in reality this is near to impossible for 2 reasons. Second: There will be rigging like always. Request to everyone in PAK! most probably Lahore will select PML-N again since they have reasons to support & be affiliated with PML-N, similar situation is in Karachi for Karachiites as they have reasons to support & be affiliated with MQM & the way you feel hurt if some one give negative/harsh comments for PML-N/Nawaz Karachiites feel same for MQM/Altaf, we all should respect each other's choice..
Whoever will win,fair election will make pakistan true democracy. I just hope pti wins so government has pressure to perform. Hope mqm wins.. Never know it's Pakistani election. Pity my nation which is resting the hopes of "tabdeeli" on the shoulders of two leaders in their 60s, both fielding tried, tested and scandalized candidates instead of young new blood with fresh ideas. If this is the tabdeeli we want, then God help us. Unfortunately PML-N have started their rigging activities. A case registered against PML-N worker, identified as Abdul Muatadir, for forcefully entering a polling station in Rehman Pura School. Security officials also recovered pistol from his possession. He has been taken into custody. @Naveed "I will give PML advantage as they have done extensive work "
It is unfortunate that the ones who are supposed to make laws and implement them are judged on making 'nalis' (sewerage drains). And even there they loot most of the money! PML(N) is very expert in manipulating election results. They must have stuffed the ballot boxes with fake votes before the boxes are sealed. @osman : You are sadly mistaken my friend. This govt couldnt care less about people or pressure or getting votes because they rule by rigging the system. Even if they lose, you will not see this govt start performing. they are not simply not capable anyway. One important aspect of this election that our media ignores is that despite all its flaws Pakistanis enjoy the freedom to exercise their vote unlike many other countries in the region. The credit for this heightened awareness must be given to Imran Khan for his tireless effort! Whatever the outcome of this election (NA 122) we should be proud as Pakistanis - the loser should congratulate the winner. This is an important step towards free and fair elections in 2018 inshallah. I wonder what IK will say tomorrow : "Dhandhli" ? Who will win it will not change our life. I am very disappointed with the parliamentary election system. I like PML N but today I wish success to PTI candidate. Whoever wins - Pakistanis win. See it that way? @Joe change is needed. Sick of the both parties. some other party should rule now. From last 60 years giving chances to these corrupt why not to bring new guys even though if they not perform but give chance. We dont want just roads we need better economy to stand up and live proudly in this world. I hope so PTI will win this time to leave a good lesson for current Governance. If free and fair elections are held. There is no way PML-N will win. PTI is strong in Panjab and KPK. why only sensitive polling stations army and rangers are deployed. after all its only na-122. all the ps should be treated same as done with na-246 karachi earlier this year. Pti should loose so that they can go back and focus on kpk which is right now the most neglected province. 2014 wasted and 2015 also wasted for 2 to 3 seats, but kpk cries over non performance and bleeding by Taliban. Pti, Pat, pmlq, ji, sr against pmln. Hope pmln will swee p away stays quo. And hats off to pmln against the walls and very corrupt trying to derail it. Pmln will come out victorious as a gladiator. PTI and IK will win - Inshallah. @Asgher Don't make excuses before you have lost. What if PTI wins? (I know its not probable but for different reasons than you suggest) Then your allegations of rigging will just look silly. If the PTI has really reached the roots of the people, it should win. @Asim Munir I hope your suggestions are taken seriously by the Lahorians and vote to kick out corruption from our country or at least set the ball rolling to root out corruption. It is no secret that Sharifs are one of the biggest looters of our country's wealth. No matter who wins the by-election in Lahore, the things won't change and Pakistan will remain the same or even will get worst. The problem is the Pakistani public, who over the period of 66 years has become lawless and refuse to adopt a path laid out for them by the honorable Mr. Jinnah, who being an Lawyer and Constitutional strongly advocated LAW and ORDER and condemned the bribery and jobbery (corruption in public office) in the system. @Shiraz , how do you arrive at that figure? 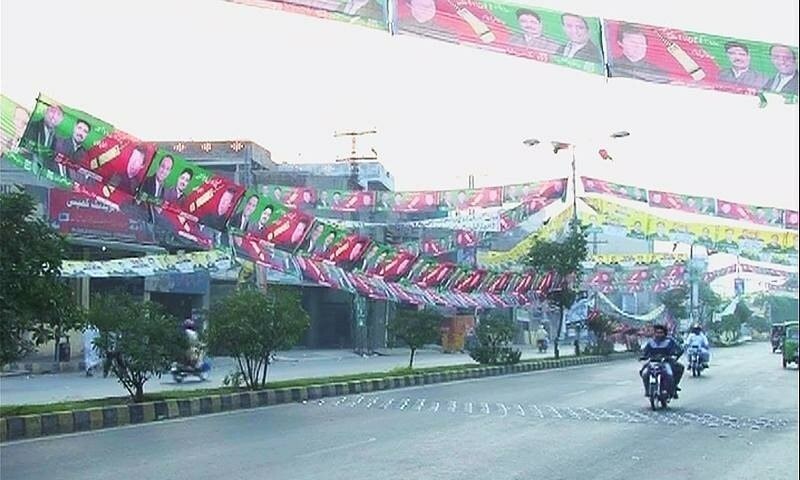 Suppose total turnout is 14,000, how will your Ayaz win with 15,000 to 20,000 votes? @imtiaz Hydari , I am amazed that you have given credit to Ik for pakistanis enjoying the right to vote and has conveniently forgotten the generations of struggle by our stalwarts, Bhutto, Benazir, Nusrat Bhutto , MRD movement, 1000 plus martyrs of MRD movement, people who suffered Zia era repression, movement against tyrannical Musharraf, Fatima Jinnah, Maulana Bhashani, Khan Abdul Ghaffar khan. Imran has never contributed to cause of democracy. He is a crickter turned politician. Could it be replica of NA-246 in the evening..
"Ayaz Sadiq has been able to gather support of a group of the Pakistan People’s Party (PPP) led by Dr Safdar Abbasi, Jamiat-e-Ulema Pakistan Noorani (JUP), Jamiat Ulema-i-Islam – Fazl and other clerics in the constituency"
All culprits supporting the bigger evil ??? It would be a worst day for me If India wins its match against SA and Ayaz Sadiq wins this seat. Pti not fighting with its mandate. Pat workers are voting for pti, pmlq voting for pti, ji voting for pti even ppp supporting pti. These all parties will contest independently in 2018 Nd contested independently in 2013. Even if pti wins this is not its mandate and will not prove anything. Alas!! All mafia against pml n but hope so pmln will even defeat this corrupt alliance. Pti not fighting with its mandate. But rather renetd mandate till 2018. After leaving kpk bleeding and with zero performance , ik still thinks he can win in Lahore? Khan sb kpk is drwoned due to lack of performance. Answer us have, 2014 wasted in dharna, 2015 for 2 or 3 seats but no attention on kpk. After attack on aps u married and after badabair attact u left the second day for Lahore leaving kpk people bleeding. Nawaz was charging security meeting on ur behlaf. U support Taliban even if they kill kpk people, don't like to work for kpk and stay mostly in Islamabad and Lahore. What is the mistake of kpk people by the way? And now u want same in Lahore? Think again. If pti wins that means people want disastrous performance like in kpk. No focus over health, corruption is at peak in kpk, education through tameer e school was a joke and now raners are deployed in haripur which speaks of police in kpk. Oteht than that 0 infrastructure, 0 jobs for kpk people, people mostly now have to travel to Punjab to find jobs. Ik goes to London takes snaps and returns no focus to meet with investors to attract investment in kpk. He is out there to bad votes in Lahore! Oh so big a joke!!! I am outside camps of both the supporters. Man!! It seems pmln has a quite a big support. Phew!! Tough for pti and number is increasing for pml n. Anyhow voted for ji in 2013 and now will vote PTI, cause of supprot from ji. But it seems a chance against pml n is quite low. Cars, wagons, buses loded with pml n people, bikes you cannot imagine pml n might win with even bigger margin. but my emotions are now with pti and can only pray for its success. Camps are flooded with pmln supporters. My heart is sinking but still hopeful for pti. If pml n wins, I will never vote again even for ji. Punjab will be stuck with PML-N and Karachi to MQM. Its really interesting to note that common man is giving their fate in the hands of elite class and hoping for the best. These candidates and there leaders never experienced the problems of common man. They never use public transport nor affected by load shedding. Any change will happen if the leadership will emerge from common public who have first hand experience of the problems. PML N winning will put people of Pakistan further down the drain, they deserve to get what is on offer for them, if they want change then VOTE for IK and TI. @M. Saeed Awan He is not a what you are describing him. One has to ensure that the elections are conducted fairly, and it does not matter who wins. There should be an end to violent politics. If PTI again alleges rigging THEY should be held Accountable this time. As mentioned above why their polling agents were not present when they were supposed to be there before start of polling? And then they are giving it a twist that the polling started as soon as Ayaz Sadiq came to caste vote. Did he enter the polling station before the polling start time? Please stop creating controversies for the sake of unity and harmony of Pakistan, hold the rulers accountable in assemblies, not in rallies and news only. I fear our so called leader's in and outside Government are damaging Pakistan perhaps more than what Modi can. SA done it by beating India in 1st ODI, now let see what fate brings for PTI agaist PML N.
@zachishtti ...Guys what's Update so who is winneeer... i believe polling should be stopped in few minutes !! @Jaff PTI expected to win by 5000 votes . @Shiraz : I agree with you and surely IK will hold a press conference tomorrow speaking angrily while reading from a paper threatening NS and EC Pakistan with dhrnas in Islamabad. @SR Totally agree with your comment. Seems like all puncture stories will be laid to rest today..
PTI win or lose, hardly matters ........... PMLN is working for us now, thanks PTI / IK for your relentless leashed you collared around the so called lion's neck. and well done COAS as well who is not letting them sit easily either. PTI win or lose, hardly matters ........... PMLN is working for us now, thanks PTI / IK for your relentless efforts and the right rope you collared around the so called lion's neck. and well done COAS as well who is not letting them sit easily either. PMLN had made a water-tight plan to win, no matter what .. thats why it took them so long to let JC and SC to go ahead with de-seating Ayaz Sadiq.... worst, if pmln smells any chance to lose then they will work on plan and will manipulate to defer the elections for a very long time... may be seat remain vacated until next elections. Why Boxes were not Sealed in front of All reps. Isn't ECP is responsible to hold Free & Fair Election. @Shehzad "Punjab will be stuck with PML-N and Karachi to MQM." Karachi is not stuck with MQM. Karachi supports and votes for MQM with love. MQM and Urban Sindh are incomplete without each other. Imran Khan must wait for his turn till 2018 and stop the efforts of toppling the gov. after every now and then. Uptil now his politics has been negative mainly of leveling allegations. Perform and perform khan sb. That is how you will get votes. How many days you were in kpk? Do you believe people are fool enough to vote on criticism and zero performance? Had you accepted judicial commission report imran khan u would have had life line. First jd and now people of pakistan. Do you now say people did rigging. Stop please we know ur anxious due to pml n performance but please you should perform as well. It seem that the Lahorites preferred Sunday rest instead of casting their votes for good practices and democracy.The turnout is expected around 30%.The thinking has not changed"It won't effect us whoever come to power".Pakistanis does not need change and the prove is that all the social and economics denominators are sliding from bad to worse.Poor IK. @Jahangir I agree, wrong decisions of IK both personal and political are hurting IK's chances of doing anything substantial in Pakistan's politics. Genral Musharraf rightly pointed out that an alliance should be formed to get rid of these 2 (PPP and PML-N) status quo parties. Now look how these 2 parties have distroyed all the hard work done by Genral Musharraf. Compare what Pakistan was under his leadership and what we have now. Already said that stay from supreme court is also a lifeline for pti because it avoids embarrassment. For pti it should have been a booster if pmln was able to take stay in na 122. Pti is itself responsible for such embarrassment. @Sab Se Pehle Pakistan you have again safely excluded kpk. Where is kpk standing right now under revolutionary party? As for Pakistan now it is well on track. Terrorism eradication, infrastructure s, financial development, mass projects and much more. Atleast pmln is doing something. I am from kohat kpk but beleive me pti is not performing at all, and we have a reason to say it. But still time left pti can still win hearts through performance get rid of tareen mafia and get back wajih sb. @Sab Se Pehle Pakistan now how should we form alliance to get rid of Taliban supporters and the one who always create hurdles in performance and who themsleves don't perform? Had pti accepted jd report it would have increased its respect.had it then got back to kpk started performing it might have been mighty for pti. But no sheikh rasheed came, tareen came and other mafia came and de tracked imran khan. Tomorrow Ik will be blasting ECP for for his own failure . Answer us who is umpire khan sb?? Who forced you to speak against CH iftikhar and ramday? Who made a dharna alliance between pti and Pat. People are umpire khan sb. Stop seeing directors as your umpire rather see us, work for us we will raise finger for you. Let go off shortcuts. If the allegation is true then why are the polling agents not following the rules that are agreed upon. We have election of officers in our organisation... before sealing of ballot boxes they are inspected by representative of all the running candidates in front of representative of election committee with an signed affidavit. Pmln against pti, Pat,pmlq, sr,, ji. Hats off to people first and then to pml n who rejected mafias. Jamat e islami now also have to answer as to y they were supporting pti? By the way we are digging for umpire finger. Khan sb many questions are waiting for you. Starting from allegations and zero performance and big question why do you not condemn Taliban? Now what else IK in his bag? Why the hell pti have ticket to aleem khan? Imran khan u knew about his background and his and fame in case of land but still you gave him ticket. I was a stauch supporter of pti.but now good bye forever for every party from.my side. Why.didn't u give ticket to.some young and educated person, you found.only.aleem khan? Aleem khan was all pti had to offer? All others disappeared? Where is you slogan for young chnage makers? But you gave ticket to land mafia dealer. Tell us who is giving you advises? Look round and get rid of them instead tale advises from gentleman like justice wajih. People like Khattak, tareen, Qureshi, CH brother s will bring good name for you? Think again. @Farooq only irregularities have caused the reelection. In fact PTI leader ship failed to provide any proof of rigging ,forget about planned rigging. Their statements were totally different in courts of law, as compare to public statements. No mention of 35 puncture in courts . actually PTI leadership accepted that 35 puncture was a political statement. We had lot of hopes from them but PTI leadership has become just a gang of Talkers and not Doers. Ik failed to prove rigging in front of JC, said 35 punctures were a political statement, asked for forgiveness from CH iftikhar and ramday, did not provide evidences of claims made during dharna and when JC decided against pti it started agitating again. But now people have put a final shut down call on pti. Can not trust Pakistani politicians. Polling, polling stations and counting must be controlled by neutral people non-Pakistani. You can not beat our politicians in rigging. Once for all you will see real results by doing this and no politicians can dare to complain about it. Imran Khan must have recalled his defeat in Karachi NA-246. IK has nothing but to cry unnecessary and waste everybody's time and money. Next time do not create that kind of fuss. @M. Saeed Awan Since when this supporter of Corrupt rulers became Gentleman? Shame on you and your greed. Minus ji votes of 5000, minus 6000 votes of pmlq, 4000/votes of Pat, 3000 votes of ppp and 5000 other.miscellaneous. means if ik comes second by a diffrenec of 15000 it is not 15,000 but 40,000/diffrenec as all rented mandate parties will contest independently in 2018 some of which even contests independent in 2013. Means imran real mandate had fallen to 40000/difference Open your eyes imran khan and focus on kpk. What a circus ! Instead focusing on solving problems and setting country in the right direction these people are focusing on personal gains. God help us all in their leadership ! Have the loosing party pay all the expenses of this drama see how they will dare to come forward with personal agendas again in the future. Public money and security personnel being used can be utilized to protect the poeple. Shame on these politicians ! 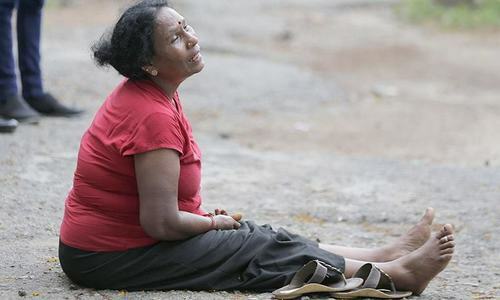 @Naveed Be ashamed of yourself for Greed. Think of better and Clean Pakistan. PMN can do what now when they could have done in the part. Think of better and clean Pakistan and not just your Greed. Ayaz Sadiq was much better candidate than Aleem Khan. Imran Khan must change his way of talking and calling his opponents. People voted to a decent person. @Joe totally agree with you. IK is wasting his time. He should stop,go and settle in an european country and enjoy his wealth and let it(pakistan) be. Somethings never change and better left alone. Aleem khan brought embarrassment for pti. Still will give tickets to corrupts and people with money? Where is tabdeeli? Supporters were fooled. Answer us why u left your ideology that you will give tickets to young and erudite? Now IK has to review his policy and accept that single handedly he cannot bring the change and need support of Mr Musharraf and MQM to bring real change in Pakistan.He must now realise and get out of the fobia of single man. Agreed . MQM/Altaf and PML n/Sharif were always labeled ,the product of Zia regime. But over the years ,They have become very popular n their constituencies . They have overcome hard times and Military actions. Reason is simple ,They are not only talkers. They are Doers too. The other political parties should learn this basic point. They are just playing Sky high promises and blaming games. in Pakistan, election is like war between 2 parties. For God sake, let it remain election. If we have survive like a nation, peace, tranquility must be maintained. There is no use fighting like uncivilized people. This election hopefully will vindicate the PML-N candidate for any wrong doing in 2013. PTI's should accept the election results whether it wins the seat or not. This election will not be 100% perfect, few minor incidents should not change the over all results of the election. Accusation of corruption and large scale rigging should stop after the elction results are declared by the election commission because the election was held under the supervision of the army. People defeated arrogance, bad language, false allegations, immature politics and futile excuses. Pakistanis are really mature and they can difference between decency and indecency. @Jamal You cannot compare NA-246 with NA-122. MQM had defeated PTI with a record margin in a very tense and unfavorable conditions. Whereas PML has won with a very narrow margin and in favorable conditions. MQM is at par. 15000 votes added by pmlq,Pat,ji sr for pti. This is not 4000 votes defeat but it is a big defeat of around 20000 votes. because Pat, pmlq and ji will contest independently in 2018. Big victory as all mafia was defeated. Congrats PML(N). Learn to be patient IK. As a Pakistan , i feel more happy when a sound roars " Pakistan Won The Elections " rather than " PMLN oR PTI won the elections " . The victory margin is less not because of PTI revolution but because of thousands of JI and PAT votes for PTI candidates. Moreover, NA144 reminds us that outside cities the election is still about the candidate not that about parties. Bad NEWS for PTI. I think the mean reason for defeat is the wrong person elected by PTI. According to ARY NEWS FIR was registered against PTI candidate few years ago and even Khan,s sisters did not cast the vote. A lesson for PTI to learn and do not make those mistakes in future. Winning with margin of 4000 is definatly not a big win. I am not PTI and not PML N or any party sympathizer. PTI should be made accountable for wasting so much time, money and resources on this stunt. Stop learning politics on our expense. Well done Ayaz Sadiq. PTI should pack up and leave Lahore. Country has to move forward. Excellent news. This proves the incompetency of PTI leader Imran Khan. Now, what do IK and PTI sympathizers think ? Another dharna ? Who ever wins, Pakistani will lose because there is no process of transprancey. Pakistan need election reforms. To hell with this election. Govt has spent 1.5 billions rupee on this election. Who gained what I don't know. People problem will remain same. GOD save Pakistan. Win is a win, be it by an inch or mile, biggest loser of the day was IK's dharna narrative of rigged elections, and assumption that 30,000 bogus votes were in favour of Ayaz Sadiq. I am no supporter of PML N,,however its time that PTI should stop living in a fools paradise,,,and come out of the wishful thinking. NA 246 and now NA 122 ,, you hv been clean bowled yet again,,, lets get on with more serious issues at hand. Dharna parties dine n dance will not lead you anywhere. Get back to your pavalion and rethink your game plan and strategy. I dont know if to cry or be angry when I see poor people dressed in rags, chanting slogans for PMLN, should they be pitied that they don't realize that they are poor, uneducated and unhealthy because of PMLN/PPP policies or should be angry at them that they why do they keep voting for the same parties and there is no change? Observer from outside. Pmln while in the sitting government was expected to win all. Yes, they won 122. But very narrowly considering they call lahore their fort. They lost provincial seat with a heavy margin from in sode their fort They lost to independent That 2 out of 3 they lost. One from their so called fort. I think its time to worry for pmln. Another message ; PPP is officially out . PTI should thank Zardari ! Personally. Over all i think pmln is the looser -- once people will sit down and think. After the celebrations are over. Things could been worse for pmln if railway minister was also running. People have to remember. Pmln picked which seat to do re election on. And that they are the sitting government. Yet they managed to loose 2 seats. And won only 1 by a very narrow margin. @Abc ........ and you think PMLN is performing ? And they win by narrowest of margins in NA 122. Out of three contested seats pmln wins only one and that too by a whisker. If this was supposed to be the safest seat in the heart of pmln then I predict they will lose bunch of seats in punjab come 2018. Mark my words. What a Joke ? Not even 50% of the registered voters cast their votes and the difference of votes is merely 4000 in a constituency of 350,000 voters ? Even before the start of polling the intentions were very clear for rigging / bogus voting and at polling stations 96 and 98 voting was temporarily suspended also. IK is right as long as Nawaz is in power there can not be fair free election. @Remote are we discussing trains again? All Pakistani voters must be honest when making good decision. Do not sell their votes. Selection must be on merit basis. Since I do not live in Pakistan and can not vote therefore, hope for best results. Good people will do good job for Pakistan. Corrupt candidates if elected will do more harm then good for the country. Pakistani voters must study about their candidates past and present work. @Farooq Rigging has not been proved by any court only irregulaities were there. The result will testy it. Team of PTI think tanks! PTI is finished as a major political force. A small margin of 4000+ votes should ring the alarm bells for PML. Change is taking place, for sure. God doesn't change people's condition until they want to change themselves. People are fool and elect time-tested ,corrupt and liar leaders again and again. Pakistan's circumstances will not get better under these kind of leadership. I was a school boy when I saw these leaders making hi fi claims ,and now I am in my late 40's these leaders are same they make same claims to put every thing right in Pakistan,nothing has improved rather Pakistan is facing more crisis ,poor a re getting poorer as the years go by.Under PML -N and PPP govts. nothing good will come for Pakistan.They are big liars.For God's sake People of Pakistan don't support them . PTI is losing its voters too because of non sense dharnas and speeches by the leader. I also voted for PTI in 2013 elections just to see a change (i never liked PTI) but in future i will never vote for PTI. They dont have any specific vision. Imran Khan's vision is, Select me as a PM and everything will be alright. If i win, i win and if i lose, its cheating. C'mon man, its not a galli muhallay ki cricket. Meri batting nai i to main bat ley k ja raha hun. PTI lost consecutive 8th NA by-election even from where he was ruling (haripur). All parties can do big dharna and Jalsa but election is something different. If he had accepted the 2013's election results and started working for the betterment of KPK, he would be the PM by winning 2018's elections. I dont think so that he will ever become the PM now. He may lose many seats in next election.